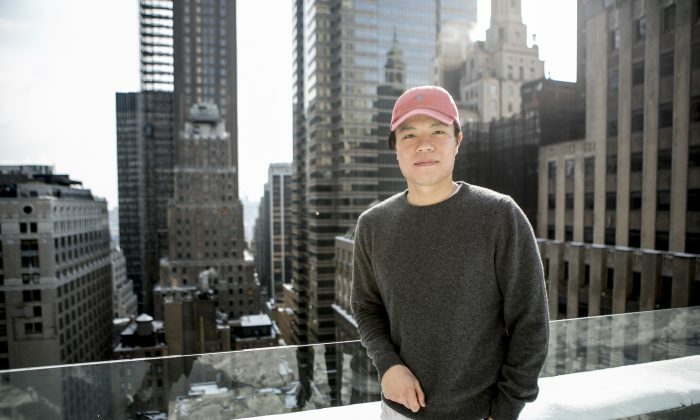 NEW YORK—Hong Kong-born clothing entrepreneur Elton Hui has a surprising fascination with Americana and American history. His new home in the Financial District is decorated with neatly framed photographs of late American celebrities, like Marilyn Monroe and Steve McQueen, Disney memorabilia, and U.S. military souvenirs. Buying his apartment was a decision he made after a lengthy hunt for, for sentimental reasons, an art deco home. Hui (pronounced Hoy) had originally sought to live in an art deco building because he felt that architecture represented the time when New York City was at its zenith, in the 1920s and 1930s. But the 27-year-old was deterred when he learned that a lot of art deco buildings were co-ops. “In case of an emergency, I’ve got to sell this place and have the cash,” he said. With his budget of $1.1 million in cash he searched extensively on the Upper West Side, a little in Hell’s Kitchen, and twice in Brooklyn before he and his broker turned their attention to the Financial District. Hui figured he would need at least $2.5 million to get what he considered “a decent place” on the Upper West Side. Apartments on the Upper West Side average around $1,500 per square foot, according to trulia. Hui said the majority of the properties he looked were between $1,300 and $1,500 per square foot. A landmarked Italian Renaissance Revival building called The Apthorp on the Upper West Side really impressed him. It was built in 1908 to be the largest residential apartment complex of its time. The Apthorp is set around a large interior courtyard with water fountains, terracotta-colored paving, and landscaped gardens. A recently added 6,500 square foot amenity suite has a private spa with saunas and steam rooms, and a fitness center. Rentals for a four-bedroom apartment in the building cost around $30,000 a month, according to Streeteasy. Hui’s broker Nile Lundgren of Dallien Realty took him to see a $1.1 million apartment in a former knitting factory at 55 Berry Street in Williamsburg. The building was built in 1910, and converted into condos in 2005. “It was cool but … I just might as well stay in the city if I’m paying that much,” Hui said. Hui found the idea of living in a former knitting factory appealing because his family’s company specializes in manufacturing sweaters. His father started the family’s sweater manufacturing company 15 years ago, after China opened up to the West. Their factory is in Shenzhen in mainland China. Hui came to the United States at the age of 13 to study, and attended Valley Forge Military Academy and College, a military boarding school in Wayne, Pa. He later majored in fashion marketing at The Art Institute of California in San Francisco. Hui and Lundgren looked at a duplex in a new development at 540 W. 49th St. in Hell’s Kitchen. The 1,092 square foot unit had a floating staircase leading to a mezzanine master bedroom and en suite. But Hui was warned about new developments. “There’s a lot of hidden costs when they are about to close,” he said. His broker told him because he would be purchasing directly from the sponsor, and there is little inventory on the market and such high demand, developers are pushing closing costs off to the buyer’s side of the deal. For example, making the buyer pay for the sponsor’s real estate attorney. They looked at 15 Broad St., across from Federal Hall and the Stock Exchange. Hui thought the building was pretty nice, and the price was good, but he was concerned about the construction quality of the interiors. He looked at the Cipriani Club Residences at 55 Wall St. The beaux-arts building was built in 1842, and a former home of the Stock Exchange. Hui thought the building was amazing, but the monthly common charges were “just way too high” at around $2,000, with monthly taxes in addition. Lundgren then took him to see the building he ultimately bought in: 20 Pine. One of the reasons why I like this building is because the Federal Hall is across the street. Hui was blown away by the aesthetics of the amenity levels, and he liked that the building was formerly a bank, so the amenities are where the huge vault used to be. The 421-G tax abatement until 2021 was also a huge draw for him. While the apartments at 20 Pine have soft ebonized oak flooring, the building’s amenity levels have light beige stone flooring. As you walk past the gym into the large lounge area and the adjoining billiard room, beige sofa after beige sofa catches the eye. Each sofa is adorned with a contemporary-shaped cushion. An opulent stone staircase takes you down to the spa level, which has an indoor water feature, a 60-foot lap pool with limestone finishes, and a locker room, massage room, and steam room. The building’s interiors were all designed by Armani Casa. “One of the reasons why I like this building is because the Federal Hall is across the street,” he said, adding that the landmarked building was so short their views would never be obscured. “But down here, I like this building a lot,” he said. Hui looked at several apartments in the building, before he chose the one he purchased: a 1,005-square-foot loft. But the purchase didn’t go as smoothly as Hui had hoped. After his offer was accepted and they were drafting the contract, someone came in with a cash offer above the asking price. When Lundgren told Hui that he might lose the apartment, Hui decided to be patient, not rush into any impetuous decisions, and let the situation unfold naturally. Hui was ultimately successful in his purchase. He secured a closing price of $1.09 million.